Understanding portable air conditioners and what to look for when buying one is made much easier when you have a basic knowledge of some of the most common terms used in reference to them. 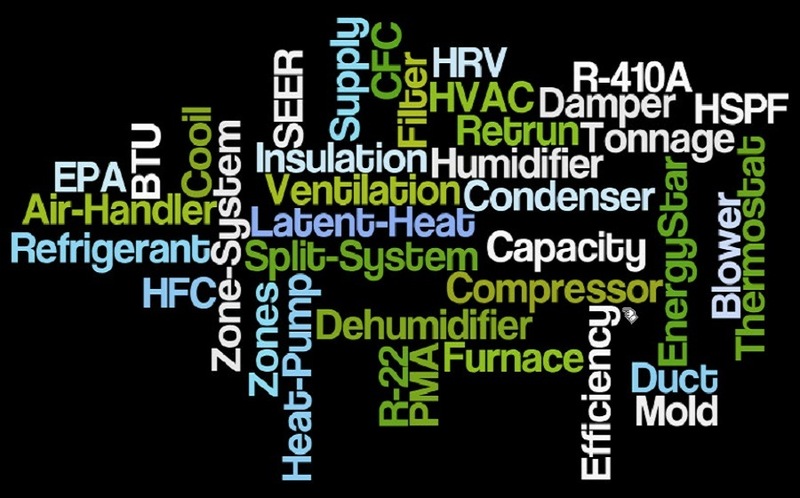 Here is a quick list of some of the terms you are most likely to encounter on the subject, and their importance in relation to portable air conditioners. BTU stands for “British Thermal Unit.” This is most likely the most important term when it comes to portable air conditioners, and the first spec you’ll see listed when shopping for one. It references the standard unit of measure that summarizes the power of the unit in relation to how big of a space it should be used for. Air conditioners don’t merely blow cold air into a room with warm air. They literally remove the heat from the air. By definition, BTU refers to the amount of energy needed to raise the temperature of 1 pound of water 1°F. When it comes to air conditioners, this measurement refers to how many BTU’s per hour the product can remove from the air around it, which is how the area is cooled. So, when you see a unit listed with a BTU amount of 12,000, that means that it removes that many BTU’s per hour in the appropriate sized-space. This is a term that is familiar to most. For those that aren’t familiar, Square feet refers to the size of a given space. To measure your space, multiply the length of the room by the width, and you get the square footage. This is important when it comes to deciding what size of unit you need, BTU-wise. You likely know what ventilation means, but it’s a little more specific when it comes to portable air conditioners. In this case, it refers to the ventilation that all portable air conditioners are required to have. It’s fairly simple -- portable A/C’s expel hot air during the cooling process, and it needs to go somewhere else besides the same room. Most portable units are vented through a window, but some others prefer to vent the unit through a sliding door, or even in a custom hole in the wall that leads outside or to an area like a garage. The ventilation is done with either one a single-hose, or a double-hose. Double-hose systems are generally more efficient. This term is probably familiar to most. Wattage is a way to measure the amount of power required to operate an electrical appliance or device. Wattage amounts on a unit are indicative of how many watts they consume when in use. The less wattage used, the less energy used in your home. You want a unit that will offer the best amount of BTU’s, while using the least amount of wattage in doing so. Which leads us to the next term. A portable air conditioner’s energy efficiency rating is its BTU rating over its wattage consumed. You divide the BTU amount by the wattage which results in the EER. The higher the EER, the better the unit is at making the most use of its energy when running. This will lead to some significant savings on your energy bills over time. Portable air conditioners are never completely silent. The actual noise level of the unit is an important criteria to most shoppers, especially those that want a unit that is as quiet as possible, even when being run on a max setting. Because of this, it’s common to see a decibel level listed in a portable air conditioner’s specifications. Decibel level is a way to measure sound. 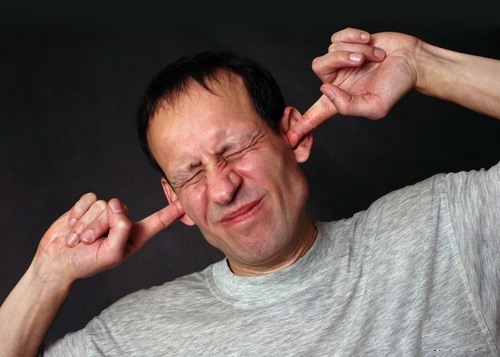 For example, the lowest possible sound that can be heard is 0 decibels. Human conversation at a normal loudness from 3-5 feet away is around 60-70 decibels. Many portable air conditioners peak at about 50-55 decibels when they are on a max setting. Humidity can be good for certain things, but when it comes to your home, it’s best to keep ﻿the humidity levels low. This results in a more comfortable atmosphere that feels less clammy due to the drier air, and also prevents mold growth and moisture damaging wood, electronics, and several other items in your home. 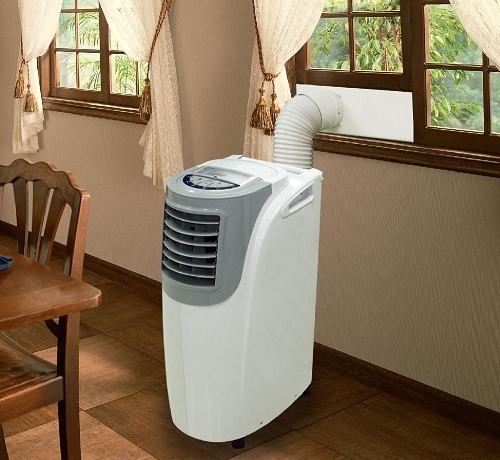 Portable air conditioners actually act as dehumidifiers because of the way they cool a room. Part of the cooling process cycle that these units go through involves actually removing the moisture from the air while cooling it. The result is a cooler space, but also a less humid one. Dehumidification is a common term you’ll find listed on a unit’s specs. This refers to the amount of moisture the unit can remove from the air over a 24 hour period of left to run the entire time. Portable air conditioners remove moisture from the air when they are cooling a space. This creates condensation that can begin to accumulate inside the unit, depending on the model. This issue can be dealt with in a few different ways. 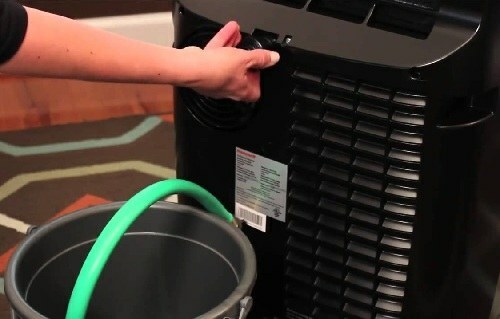 Some units have a way to collect the condensate, allowing you to dispose of it when it gets full. This most often involves a sort of tray or bucket underneath the unit. Others come with a drainage hose that you can direct either outside, or to a floor drain. These are effective and all, but not very convenient for most. Self-evaporative portable air conditioners use some of the condensate to cool the internal system, and evaporate the rest. This is the best choice for those that want a more efficient unit, while also having a more convenient one that doesn't need to be constantly monitored. Most self-evaporative models still have a drain plug, just in case there is some leftover condensate when conditions are extremely humid.